The data will be used for the preparation of OGP’s first global flagship report (due in 2019), but we wanted to make it available to you in advance. To find out more about the OGP Flagship Report, click here. For other versions (.csv, and Google sheet formats) as well as data definitions and method documents please see the folder here. The folder above includes a summary database of the main indicators in .xlsx, .csv, and Google sheet formats. 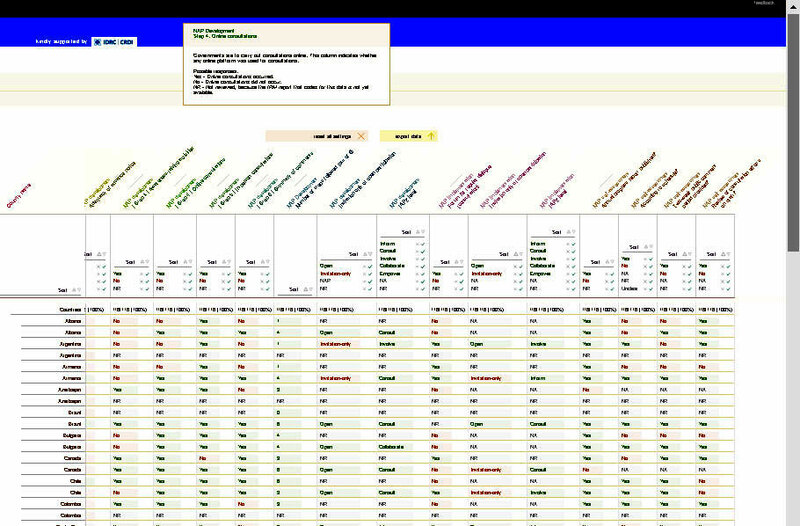 There is also a database that includes all formulas and underlying data for more advanced users. The data dictionary with definitions is included in the databases, and is also available in .csv format as a standalone file. What have countries promised - and what have they delivered? How did the consultations go across Africa? Which countries have commitments on fiscal transparency? How many starred commitments does Albania have? What happened to the UK promise on beneficial ownership? Table View (Commitment Data) gives access to the full details on the commitments. This view has information on impact, relevance and completion. You can see which commitments are starred and which ones actually opened up government. Finally, each commitment is classified with tags, and assessed on relevance to OGP values. You can view the commitments as a long list, by country, or opt simply for the country statistics. Table View (Process Data) gives users the ability to quickly evaluate country performance on their OGP process. You can easily see how each country is doing on the official OGP consultation guidelines and if countries have a permanent dialogue mechanism in place. The data also shows to what extent government and civil society work together (IAP2-spectrum) and on how countries performed on their self assessment. As it contains data for various national OGP cycles you can also see if countries improve over time. Use the filter options to narrow comparisons to countries or performance areas you care about. 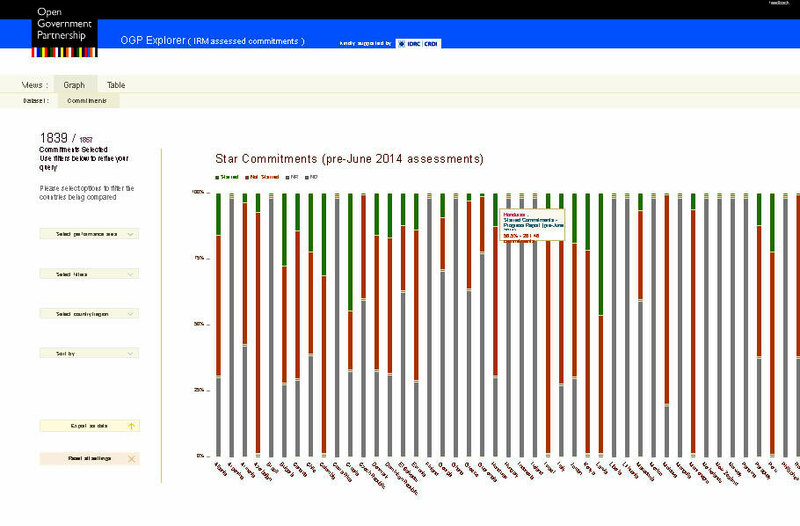 Graph View of all commitments allows users to visualize the IRM assessed data in dynamic and effective ways. For example, you can make graphs based on completion, relevance or impact; select values or tags; select countries or regions and finally select a sorting method. Moving your mouse over the bar chart will give you detailed statistics and the graph will change instantly when you change any of your chosen options. You can play endlessly with all three views, and once you are finished please feel free to export the data as CSV file. This allows users, researchers and others to apply use the data in their own investigations, and analysis or reporting. When you open the tool you are asked to choose between seeing all commitments or reviewed commitments only. Option 1 contains all commitments made to date, roughly half of which have been assessed by the IRM’s team of researchers . The other half contains commitments being implemented as we speak and not yet evaluated by the IRM team. For these commitments the data is limited to the commitment title, commitment details and thematic tags. Option 2 only contains the data on commitments and consultation processes that have been assessed by the IRM. The smaller data set allows this version of the OGP Explorer to perform more quickly. In addition to the more dynamic Explorer below, the IRM releases all of its data in open data format. The first database compiles all commitments or actions that have been analyzed as part of the IRM processes. The second database consists of information on how well each of the OGP participating governments participated in the OGP process as well as the existing institutional arrangements for OGP at the time of publication. A detailed Data Guide with explanations of variables, provenance, and potential uses can be found here. The OGP Explorer has benefited from the diligent work of our talented developer, Miska Knapek, whose previous projects include the Web Index of the World Wide Web Foundation. Thanks also to the IDRC who provided financial support to the OGP’s Civil Society Engagement team to make the OGP Explorer possible. Please note that we are in phase 3 of the OGP Explorer project. Coming soon are a new view with all the eligibility data, as well as extensive help functions. We invite users to let us know what features are most useful, what you would change and what additional features you would like to see in the next version of the OGP Explorer. Send suggestions to paul.maassen@opengovpartnership.org.